The unmistakable gleaming, corrosion-resistant anodized gold of Penn International V Two-Speed Big Game Reels sets you apart as an angler who fishes with the best. Penn's International V Two-Speed Big Game Reels are designed with forged-aluminum spools that are machined for precise alignment, and the 1-piece machined-aluminum frames provide the utmost in strength and rigidity. Powerful lever drag system features super-smooth and durable HT100 drag material, adjustable drag control knob, and freespool, strike and full drag settings. 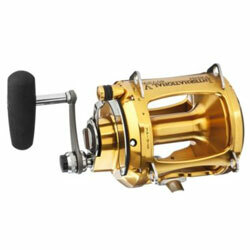 "These reels are by far the best performing and longest lasting reels on the market today. I have four 30 vsw's two 50 vsw's and one 80 vsw and i have caught everything from Bull sharks to blue marlin these reels outperform the competition in every way. " ""The international series reels are built very heavy and will handle any big game fish, I have a couple that are 10 years old and look and work like new. " "I have used these reels on several occasions and I don't see the big deal. Penn makes great reels, but for my dollar, the Senators are much better. "